“You will have to roll cast here, Milo.” I executed what I thought was a good roll cast. “No, harder-you need to get it out there,” the voice commanded. After a couple more attempts, I surrendered the rod and asked for guidance. 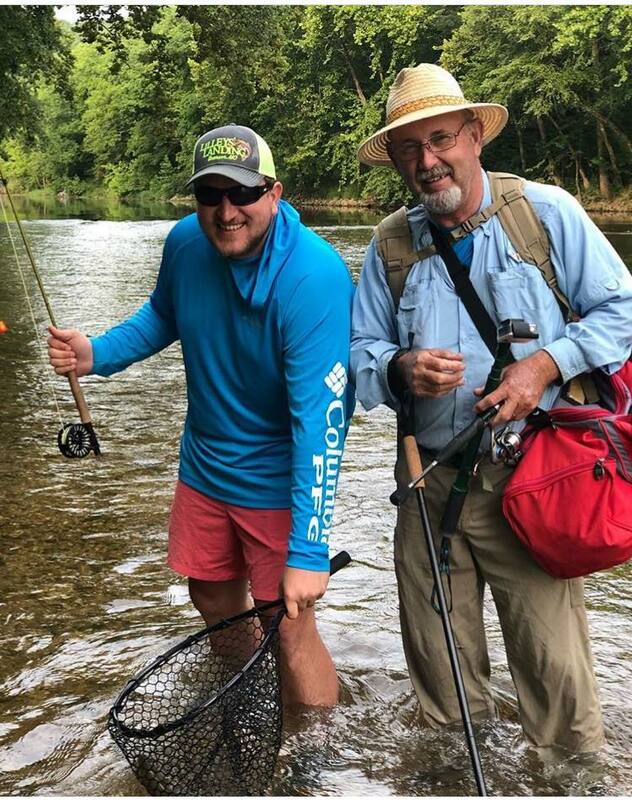 My guide, Damon Spurgeon, of Cardiac Mountain Outfitters, showed me exactly how to make the long roll cast to present a Chubby Chernobyl to some rising Rainbow trout on the Meramec River. A veteran of Operation Iraqi Freedom and Ramadi, Spurgeon makes it is easy to remember you are never too old for instruction. “I want you to catch the 20-incher rising there,” said Spurgeon, who guides fly anglers on the Meramec and Eleven Point Rivers in South Central Missouri. I did, too. But after multiple casts, the fish were not committed and we moved on. Fishing a cerise worm five feet under a float with a small weight proved to be the ticket. We waded down stream, with the bridge of Maramec Spring still in sight. A fishermen hurried past us to get to the best spot. We stopped and fished the areas he passed over. 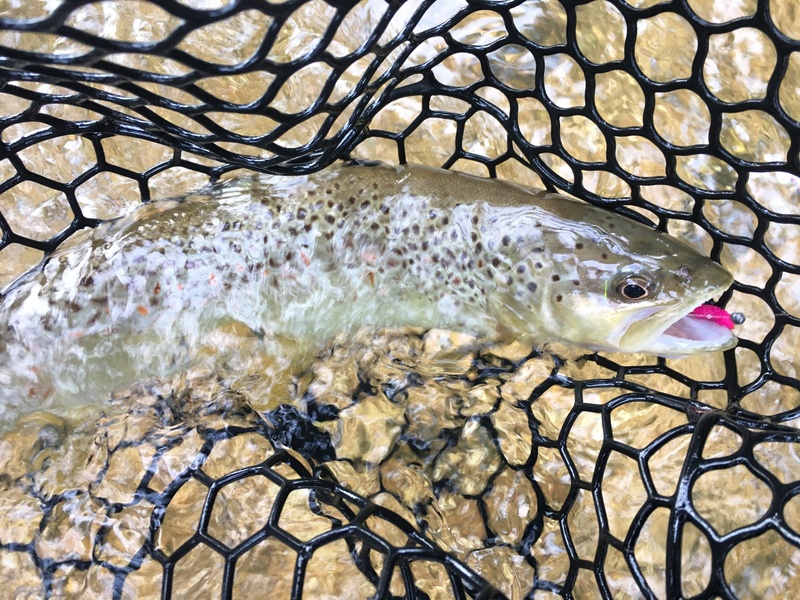 A good cast and a few seconds later a nice brown trout was in the net. A healthy Meramec River brown. “People always look over these areas,” Damon said. “You have to hit this moving water on the south side of the river. Fish are there.” The water was only a few feet deep, but I ended up pulling quite a few fish out of the spots everyone else had skipped. Before we hit a change in the swing of the river, I tossed my fly up near some structure. It was a perfect cast. The indicator dipped below the surface and the fight was on. After a good battle, a 16-inch, stout ‘bow was getting its picture taken. 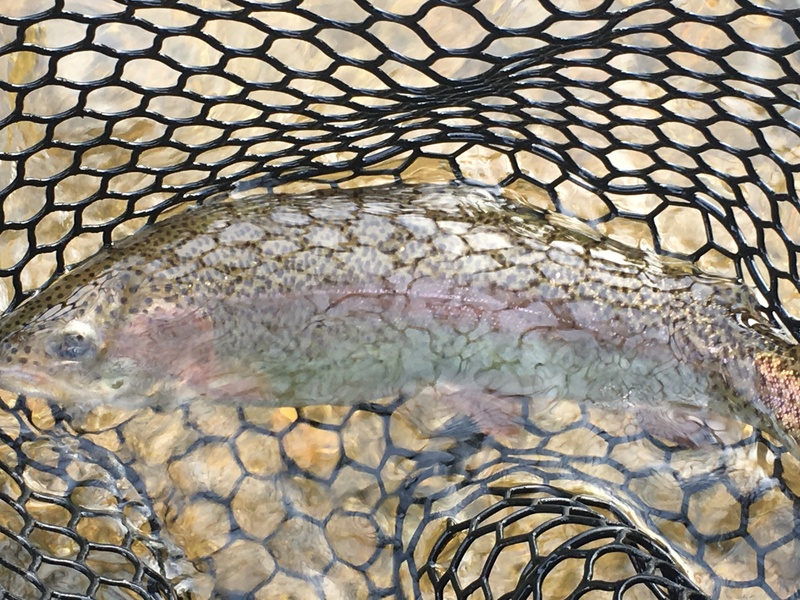 My 16-inch rainbow caught on a cerise worm. Water was low and fishing was tough, but we managed to land fifteen or so fish, including a couple feisty smallmouth. When the water is at normal level, big fish live in the stretch of the Meramec River just below Maramec Spring. Spurgeon landed a giant in April. No weight was recorded, but it was longer than the steelhead net he used to land it. “It was a 30-incher,” he said with a smile. After showing me a picture, I was convinced. It is important to note this section of the Meramec River is part of the Missouri Department of Conservation’s Red Ribbon Trout Area. And it is a fairly well-kept secret, with Missouri’s plethora of trout fishing options. Only artificial lures are allowed, and the daily limit of trout is two, which have to be 15-inches or better. It is NOT part of Maramec Spring Trout Park, so be aware of where you are when fishing the area. We encountered two illegal fishermen on the trip, and advised them accordingly–some of us with a little more sternness. The author and outdoor communicator Bill Cooper posing with a fat, healthy rainbow. Scuds, midges, soft hackles, megaworms, and cerise worms all work in this great stretch of water. Much like anywhere, finding what the trout want to eat is key. Soon, they will be keying in on big hoppers. Make sure to book your trip with Damon soon so you don’t miss out on the great action. A colorful rainbow couldn’t resist my accurate cast and enticing fly. We spent the day wading down the river, talking about where fish like to live, where big fish have been caught in the past, and fly fishing skills and techniques. It was one of those days where catching fish was the least of our worries. In my mind, those are the most rewarding. Bill Cooper, member of the National Freshwater Fishing Hall of Fame, created a nice video of the trip you can find here. To book a trip with Damon, contact him at 573-263-9776, or visit his Facebook page. 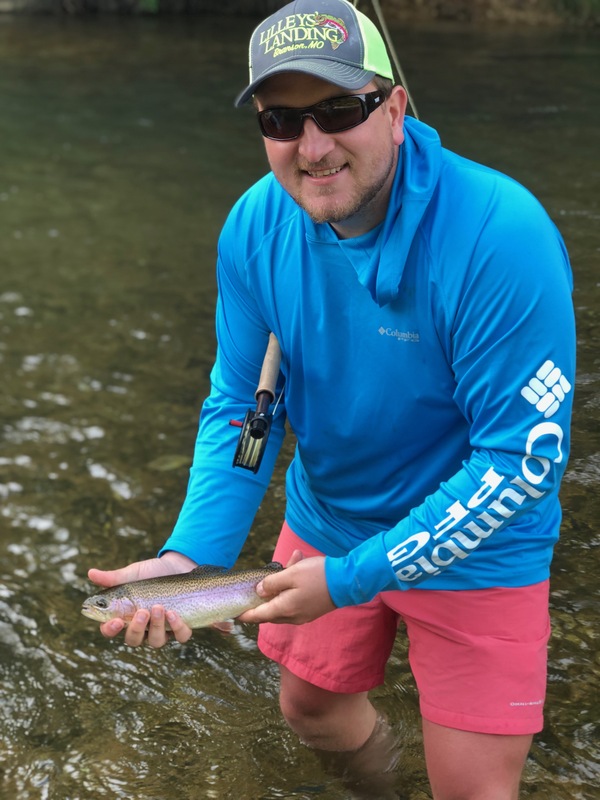 Cardian Mountain Outfitters, Damon Spurgeon, Mahoney Outdoors, Meramec River, Missouri, Missouri Ozarks, Rainbow Trout, Ryan Miloshewski. Bookmark.